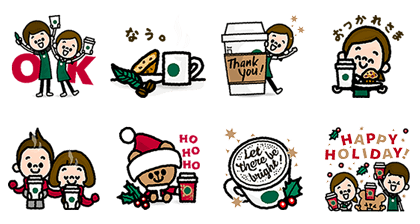 http://www.line-stickers.com/ – Starbucks Line Sticker | http://www.line-stickers.com/ – Starbucks Line Sticker | Starbucks Coffee Japan has released a new sticker set just for the holiday season! These stickers are like the perfect treat to perk up your chats. Get that relaxing cafe feel with this set. Refreshing new summer-themed limited edition stickers are here! 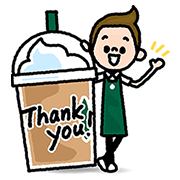 Friend Starbucksʹ official account to get these cool stickers! Theyʹre the perfect way to spice up messages to friends or send Starbucks eGifts! Coffee lovers rejoice! Give your chats a jolt with these Starbucks stickers! Friend Starbucks’s official account to get them! Available till February 24, 2016. Copyright : © 2014 Starbucks Coffee Co. All rights reserved.